Leslie Model 142 | MOSweb Online! This model uses a 122 amplifier and is essentially a short 122. 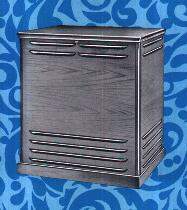 Because of it’s cabinet dimensions it has slightly less bass punch then a full sized cabinet like the 22H or 122.